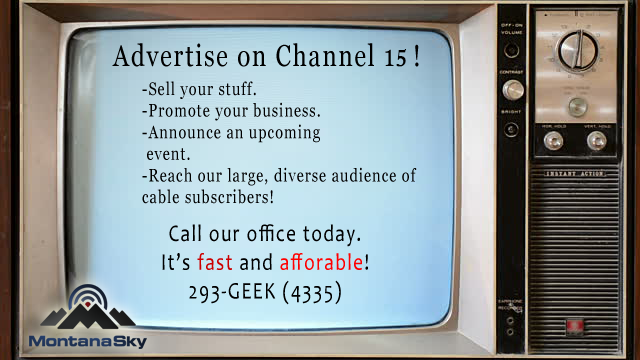 Reach our many cable TV viewers with a simple message, advertising your business or events! With over 2000 subscribers, and many more now able to catch Channel 15 via antenna, your message has the potential to be seen many times over on MontanaSky’s Message Board on channel 15. Submit your listing by clicking the link below and submitting the form online. Our team will get in touch with you directly to confirm your ad before we put it on the air. For commercial ad-insertion on our network channels, please contact our Advertising Specialists with Ad Systems at (312) 546-4442.